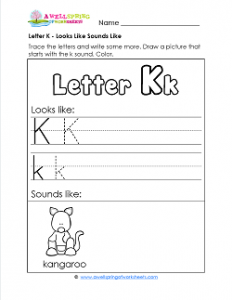 There is a kangaroo on this letter k looks like sounds like worksheet. And he’s just sitting there, looking at you. I bet he’s thinking, “Don’t just sit there like me, get to it!” And do a good job of it, by golly. Trace the letters and write them at least three times on the lines. Think, think, think of something that starts with the letter k sound and draw a picture of it next to the kangaroo. And by all means, color the whole entire page!